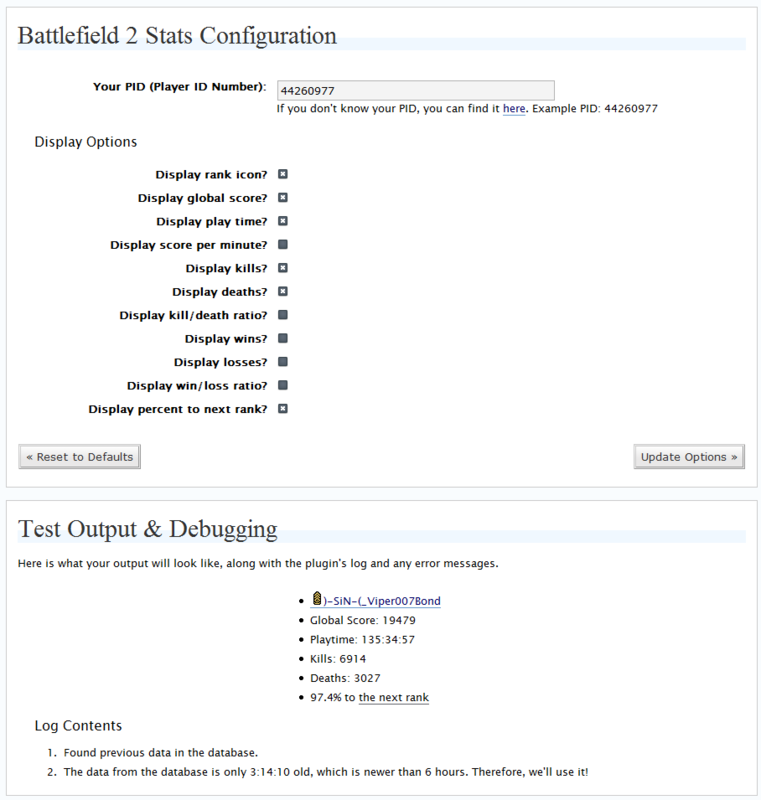 This plugin creates a function which outputs your Battlefield 2 profile statistics. The data is fetched via a XML feed from BF2S.com. It’s intended for your sidebar, but can also be used on a WordPress page. It’s fully configurable via an options page in the WordPress admin area and only requires that you add the plugin’s output function to your theme’s sidebar to get it working. To see it in action, look to your right in my sidebar, just below the weather. This plugin has been moved! You can now find it at the WordPress.org plugin database. v1.14: Complete recode of the ranks code due to stupidity on my part when it was first coded. Also various bug fixes and improved error handling. Please make sure to upload the new image file as well. v1.13: BF2S.com no longer allows the use of playernames, so this plugin now reflects that change. You can only use PIDs now. Also new are some minor improvements and bug fixes. v1.12: WordPress Widgets support and long term logging added. Now if an error occurs, you’ll actually be able to see it later on rather than just at the time it occured. Also some various bug fixes I believe (hard to remember what I changed, lol). v1.11: Localization support added. Now all of you non-English bloggers can display your stats in whatever language you wish. Also added are thousands seperators in the numbers (for easier reading) and unit abbreviations to the playtime (example: Playtime: 236h:06m:04s). You can toggle the use of that though. v1.10: Ranks introduced in the BF2 v1.2 patch added as well as many new features / improvements including an optional update checker that connects to my website every once in a while to look for a new version. v1.02: More improvements in the rank percentages (you can now choose from two percent types) as well as a widget for WP-Dash. You can also now use your player name to fetch your stats rather than only your PID. v1.01: Major “percentage to next rank” improvements. Basically, I wasn’t correctly calculating the percenteage in v1.00. ive got the same problem as other people, i play on ranked servers but my stats dont update. my nicks are 0_basalt_0 and BASALTWOLF. how i put my rank close my name? This plugin is long dead and the API that this plugin used to fetch your stats is no longer available. Sorry. Nope. Much too busy and I have no idea where to fetch the data from. Is this still available, is it an html code or an actual program, can I get stats for my whole clan to show on there own pages? U got a link so I can download? It’s PHP code, but the code fetched your stats from BF2S.com who took down their API long ago. It did not fetch it directly from EA. In short, this code would be worthless to you. Can we still download the plugin from somewhere to play about with.